Sellics Home » Sellics Blog: Amazon Strategy Tips & Knowledge You Need to Succeed » Amazon vs. eBay: Where should you sell your products? 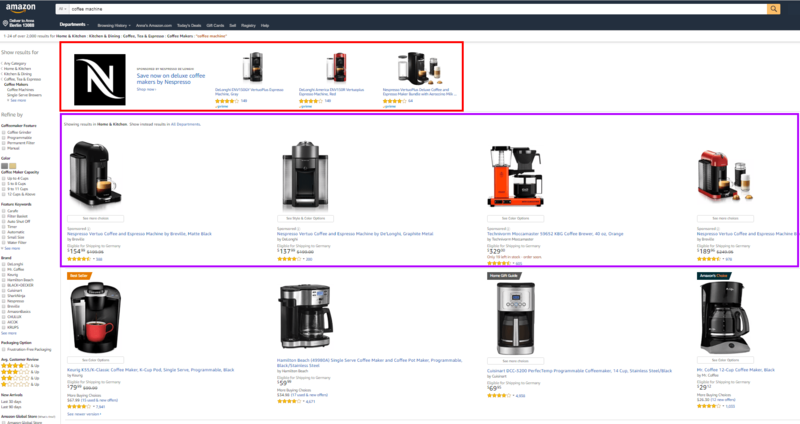 Amazon versus eBay – Where should you be selling your products? The answer depends heavily on what you have (the type of product, infrastructure, available free time) and what you want (freedom, selling support, sales). Amazon – you want to run a professional e-commerce business and reach a massive audience, are looking for a platform that offers lots of services to make business easier, and don’t mind adjusting to a strong (and sometimes unfairly biased) buyer-centric approach to business. eBay – you are building your e-commerce business, possibly selling niche products, are happy to settle for a smaller audience in return of keeping as much control over your business as possible, and being supported as a seller. Which one describes your circumstances best? That’s the marketplace you want to sell your products on. What if you’re still undecided? Then why not sell on both? An Amazon+Ebay strategy has paid off massively for many online retailers. The only limitations you need to keep in mind are the time and inventory requirements you need to meet to succeed on two very different platforms at the same time. Before we get started, we want to give a special shout-out to e-commerce Rockstar Michael Atug, who served as an active (and hilarious) soundboard and provide us with insights into the realm of eBay. He is running a Facebook group for Multichannel Sellers (in German). Check him out and show him some love! Once even the leading online marketplace, eBay now holds the title of the biggest auctioning platform. While some argue that the platform is past its expiration date, a considerable amount of buyers and sellers still find value in the extensive international reach of eBay’s marketplace. Nowadays, Amazon is the biggest e-commerce platform in the world. Considered as one of the Big Three internet giants, they have come to challenge even Google, who view them as their strongest competitor regarding the search engine. At first glance, Amazon and eBay might look like they are doing exactly the same thing: helping people sell online. And generally speaking, that’s true. But the more we drill down into the business model and processes of the two platforms, the more you will realize that they are fundamentally different. The first significant difference becomes obvious when looking at the numbers: Amazon is considerably bigger in every aspect. Most relevant to sellers, Amazon recorded 84 million more unique visitors in 2017 and registered almost double the number of active customer accounts in 2016 than eBay did in 2018. While this seems like an obvious win for Amazon, eBay has a trump up its sleeve: international reach (defined as sales outside North America). As of 2016, eBay records 62% worldwide sales across 25 sites around the globe – which is almost double that of Amazon (33% international sales across 13 global marketplaces). Access to a loyal community of Prime members is one of the great advantages sellers enjoy on Amazon. Members enjoy the value-added provided by free and almost immediate shipping, and are thereby willing to pay a monthly fee — to spend even more money! This value-focused customer behavior is also reflected in buying behavior. Out of the 40% of US households owning a Prime membership, more than 46% of Prime members shopping on a weekly or even daily basis. This customer segment is, therefore, a promising source for repeating sales. Amazon has emerged as a serious search engine for products. 44% of online shoppers start with product research on Amazon. Even Google admits that it is Amazon — not Yahoo or Bing — who is their biggest competitor regarding search engine. At the same time, while people start their search on Amazon, they often cross-check their findings with other platforms and retailers. And some of them (often the most price-sensitive ones) end up on eBay. Customers on eBay drive a hard bargain. They are here to find a good deal. This has everything to do with eBay’s reputation of being a platform for second-hand products, and nothing with the actual situation. Nowadays, 80% of products offered on eBay are, in fact, new. But while eBay bargain-hunters are very price-conscious, they also show a greater tendency towards brand loyalty. As a result, they are usually more willing to give feedback and leave a review compared to Amazon buyers. Amazon and eBay both offer a range of account structures to cater to different types of sellers. On Amazon, sellers have a choice between Individual and Professional Accounts. Individual accounts suit occasional sellers who want to sell less than 40 products per month, paying a fee per listing. In comparison, Professional Sellers can upload as many products as they want, and pay a monthly fee. They also enjoy a number of advanced features, such as bulk uploads and being able to sell products from a greater range of categories. eBay also offers different account structures. As a hobby seller, you can easily set up and start listing products immediately. 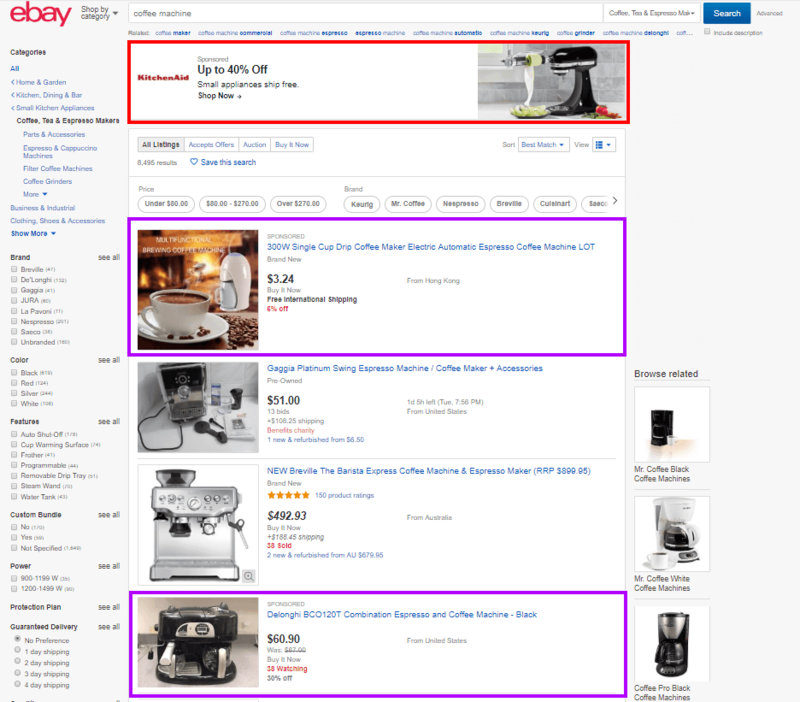 For professional brands and sellers, eBay offers the option to set up a shop, which includes an individual URL, advanced marketing options and independence from eBay category limitations. Unfortunately, it is difficult to be clear on which platform is the cheaper one to sell on. Searching through experience reports and industry publications, it seems that eBay is less expensive than Amazon. But in the end, it depends on what kind of products you sell and whether you are using additional services such as FBA. In the table below we collected and compared the most common fees for both Amazon and eBay. Please keep in mind that this is not an exhaustive list – but it gives you a pretty good idea what kind of fees you can anticipate. *For more detailed information on eBay fees click here. **Keep in mind that there might be additional fees if you do NOT sign up for an eBay store. This basic comparison confirms the general consent: on average, selling on Amazon is more expensive than selling on eBay. But it also includes greater services, such as the packaging, storage, and shipping included in Amazon FBA. The process of listing a new product on Amazon is fundamentally different from adding a new item to your eBay account. The only thing the two have in common is the fact that search results are grounded in SEO – meaning that product visibility is highly dependent on content and keywords. Amazon is all about usability. To save customers the time and effort of having to search through hundreds of different listings for the same product, Amazon groups all sellers of the same product (identified by the ASIN) into one listing. You usually only have complete control over the content of your product listing if you are a private label seller. If you are a reseller, your offering will be added to an already existing listing, making the product upload very quick and easy. In comparison, sellers on eBay can set up their product listing, even if there are fifty listings of the same product already out there. Sellers on eBay, therefore, enjoy greater autonomy about the content they want to display on their product page. However, eBay is currently switching to a product-based shopping experience. By encouraging sellers to list products using their catalog they are trying to add structure to the search results. Starting from September 2018, it will become mandatory to list products from certain categories through the catalog. If the product sold is new, details such as brand, model number, dimensions, color, capacity, compatibilities, and photos will be added automatically to a product listing. While this makes uploading a lot easier and faster, it also puts restrictions on what information is displayed and how. Being a successful online seller requires two things: people must find your product and then decide to buy it. When it comes to selling on online platforms, both these factors are mainly driven by SEO ranking algorithms. Amazon’s algorithm is called A9, eBay uses Cassini. The exact recipe isn’t known for either. But for what we know, they function in a very similar way. Relevance and performance seem to play a significant role in both algorithms. The right keywords ensure that your product shows up in search results. And previous performance (mainly based on sales numbers) then determines the rank. This means that sellers on both platforms have to pay close attention to keywords and content to drive visibility and conversion. In the previous section, we established that keyword and content optimization are central to constructing effective and highly converting product listings. So let’s have a look at the options sellers have for optimizing listings on the two marketplaces. Amazon SEO is a significant part of success on Amazon. Finding the right keywords, placing them strategically throughout the product listing and adding striking images requires some time and research. But this is effort well invested, as both ranking and conversion are highly sensitive to Amazon SEO. That’s why it is advisable to use a keyword tool for optimizing product listings on Amazon. Sellics is the leading Amazon SEO software that helps sellers and vendors to optimize their product listings to improve organic ranking and sales. Start your optimization process now! While Amazon SEO is easy to implement as a private label seller, it is trickier for resellers. If other sellers already offer the same product on Amazon, your offer will be grouped on the same listing, and you can only change the content if you own the Buy Box. Since eBay grants sellers more freedom in setting up listings, SEO optimization overall is a little easier on the platform – no matter what type of seller you are (however, this might change in the future with the introduction of the catalog). But no matter which platform you use as a sales channel, SEO optimization is central for success. Surprisingly, both Amazon and eBay offer predominately new products. Why surprisingly? Because most people think of second-hand items when they hear eBay. Being an outlet for items you find in your granny’s garage is indeed a big part of the platform’s legacy. But times are changing, and many hobby and professional sellers have discovered eBay as a sales channel for their new products as well. But perceptions are hard to change. And with a very price-sensitive customer base, professional sellers find sales numbers to be moderate on eBay. In the end, people do go to eBay to find better bargains than anywhere else, with the expectation that the best deal might be a second-hand product. The best selling item categories on eBay are car parts, phones, and accessories, clothing, shoes, and watches. In general, niche products tend to fare well on the platform – especially if they are non-commercial. Since this is the place where people sell their garage inventory, customers also come with the expectation to find collectibles and treasures from past times. Amazon is the number one search engine for product research due to its customer-friendly setup and a vast variety of products. Most Amazon sellers run a professional business, focusing on high-quality products that they sell on a continuing basis. As of 2017, the highest selling product categories on Amazon are electronics, books and movies, clothing, shoes, and jewelry. As a professional seller, all product categories are open for you to list products in, even though for some you need special permission. Individual sellers, however, are excluded for selling products in certain categories, such as automotive and powersport, business products, collectible coins, jewelry, fine art, groceries, and gourmet food, professional services, sports collectibles, video, DVD and Blu Ray, watches. One of the main differences between Amazon and eBay is the pricing structure. For Amazon, this is pretty straightforward. You choose a price, and that’s how much your product goes for. You can also set a fixed price for your product on eBay. However, what the platform is known for is the option for auction. This ranges from allowing potential buyers to make price suggestions to auctioning off a product without any fixed price. While a fixed pricing structure enables you to make more reliable profit forecasts, auctioning off a product can help you land a better price as buyers are competing with each other by submitting higher and higher bids. On eBay, you have full control over your product listing, making it a bit easier to portray your brand. As you can individualize your online storefront, buyers may recognize you, even though brand loyalty is also dwindling on eBay, according to Michael Artug. In the end, to make a sale, it is important to pop up on the first few pages of the search results, offer a competitive price and stand out from the competition. This process works similarly for private label sellers on Amazon. Pop up on top of the search results, convert potential customers through compelling content, offer value and a competitive price and voila, you’ve got a sale. Obviously, it’s not that easy, but the process is pretty straightforward. Similar to eBay, private label sellers can also set up an online storefront and display their products on an individual website. Furthermore, Amazon has now made the option of displaying Enhanced Brand/Marketing Content possible, so that sellers can tell their brand story further down on the product page. Nevertheless, many customers still think they are buying from Amazon directly, especially when sellers also use FBA. As a result, brand loyalty is basically non-existent for Amazon sellers and makes them even more dependent on Amazon’s good graces. For resellers, making a sale is even more complicated. That’s when the Buy Box comes in. We’ve already mentioned that sellers of the same product are grouped in one single product listing. And only one seller can make the sale – 90% of the time it is the seller who wins the Buy Box. Amazon determines the winner based on price and seller performance. And even worse for sellers – there are numerous products that Amazon sells itself – and thereby claims the Buy Box. While competing with Amazon is not impossible, it is hard. As a result, competition on Amazon is perceived as being a lot tougher than on eBay. However, the value that competition creates also attracts a larger number of paying customers to Amazon, as the statistics at the start of this post clearly show. One of the greatest criticisms eBay receives from its users is the requirement to use PayPal or bank transfer for making payments. Apart from the hassle of having to set up a PayPal account, it also adds a fee of $0.45 plus 2.9% of the sales value. But it’s not all bad. Rather than being an intermediary, eBay allows buyers to pay sellers directly and sends a fee invoice once per month. Only for new sellers does a holding period of 21 days exists. After that, the transfer is immediate. So for sellers wanting to receive money immediately, eBay thereby provides a better process. And that’s precicely what most sellers criticize about the Amazon payment. Amazon acts as an intermediary, collecting the money from buyers, deducting their fees and then transferring the leftover funds to sellers after a holding period. Amazon’s buyer-centric approach can explain this setup. Holding back the money allows for refunds and returns to be processed smoothly. Whether sellers find this approach convenient or not depends on how strapped they are for cash. While you might have to wait between seven (for individual sellers) and 14 (for professional seller) days to get paid, you also have the luxury of Amazon handling all the payments for you. As of August 2018, eBay is starting to move business and professional sellers to what they call Seller Hub – the equivalent of Amazon Seller Central. 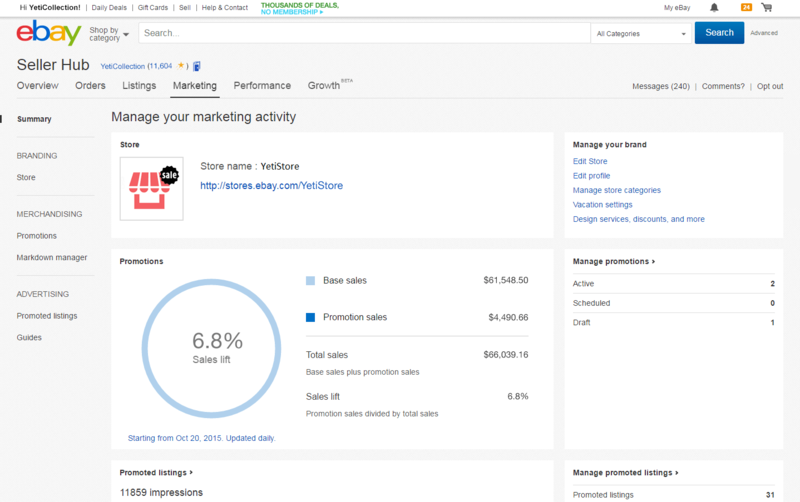 The structure of eBay’s Seller Hub is also relatively similar to Amazon’s Seller Central: you have a menu with ‘overview’, ‘orders’, ‘listings’, ‘marketing’, ‘performance’ and ‘growth’. Traditionally, the two e-commerce platforms have adopted two opposing models: customer-centric (Amazon) versus seller-centric (eBay). Most of Amazon’s focus lies on improving the experience for the customer, rather than the seller. So it comes as no surprise that many sellers voice their dissatisfaction with the internet giant. Nevertheless, sellers are usually returning to the platform due to the large customer base – who is there precisely BECAUSE of the buyer-centric approach. In comparison, eBay used to be more popular with sellers, mainly due to the greater freedom regarding payments (and returns), listings, and general selling practice. However, the tides are turning. eBay is increasingly mirroring Amazon’s buyer-centric approach. The changes seem to include downranking sellers that do not make use of listing promotion tools (from which eBay is earning a good sum of money), holding money to guarantee refunds, and pushing sellers towards offering the option to return items. As a result, even seasoned sellers not only record a significant slump in sales but also start to voice their dissatisfaction with the platform. But this may be the price they have to pay for a larger customer base. Amazon sellers can choose between two shipping methods: FBM and FBA. FBM (fulfilled by merchant) means that the seller is packing and shipping products themselves. In this case, the seller has full control of shipping costs – except that they have to be competitive. The more time-saving option is the FBA (fulfilled by Amazon) program, where sellers pay a fee to Amazon to handle the packing and shipping of orders as well as customer support. One of the most critical advantages of selling on Amazon is Amazon Prime. Amazon Prime members are guaranteed a certain shipping speed. In the US, for example, the Prime membership guarantees two-day shipping, and some zip codes even qualify for 2-hour delivery! To take advantage of the Prime network, you do not have to sign up for FBA — you can do Seller Fulfilled Prime — but it might be the safer option to fulfill the shipping speed requirement. The Amazon A-Z Guarantee has made shopping with them online easy and secure for buyers. The guarantee covers both the condition of the item when it arrives at the customer’s doorstep, as well as the timely delivery of the purchase. Customers can thereby file a claim to Amazon directly and request a refund/return. The Amazon team investigates the claim and decides the appropriate action to be taken — according to sellers’ experiences it is usually resolved in favor of the customer. While this is a great disadvantage for sellers (and often a point of criticism), it has also attracted a large and loyal customer base to the platform. Sellers on eBay can decide between five return options: no returns accepted, 30-day buyer-paid, 30-day free returns, 60-day buyer-paid, and 60-day free returns. As a result, they have a lot more freedom than Amazon sellers to pick the option that best suits their business model. However, eBay also makes very clear that the conversion rate will increase significantly when sellers offer free returns. Both Amazon and eBay offer standard promotion tools such as discounts and bundles. The more interesting marketing tool to compare, however, is Pay-per-click advertising (PPC) and eBay’s equivalent, Promoted Listings. Sellers pay per click. You select your desired Cost-per-click (CPC) and based on the amount you pay as well as the relevancy of your product your ad appears in the search results. 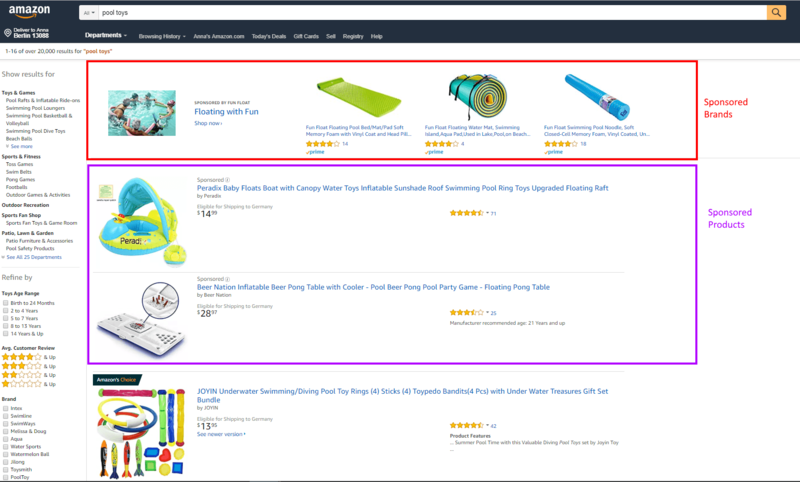 Only after zooming out to 50% do the first non-sponsored products show up above the fold of the search results display. At standard zoom, PPC products take up the entire space above the fold of search results. Only after scrolling down two or three times does a customer see non-sponsored products. 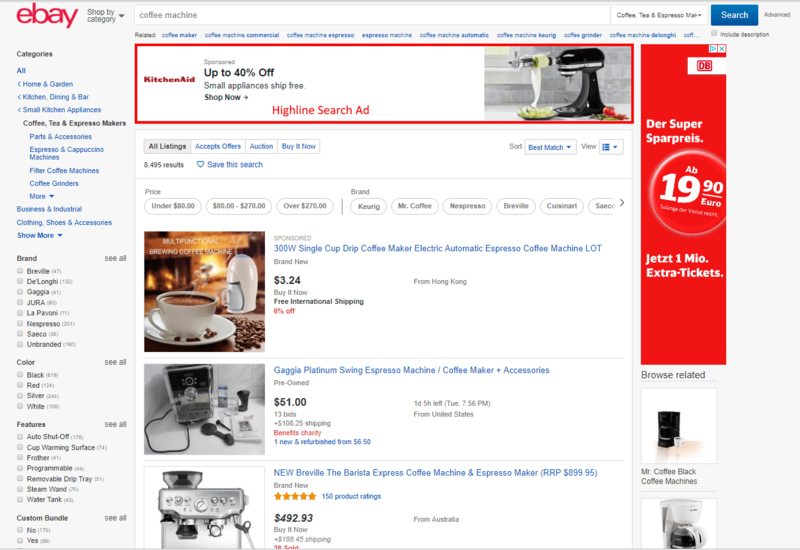 Even though more and more real estate space is dedicated to product ads, non-sponsored products can still rank second or third on eBay. And did you notice? 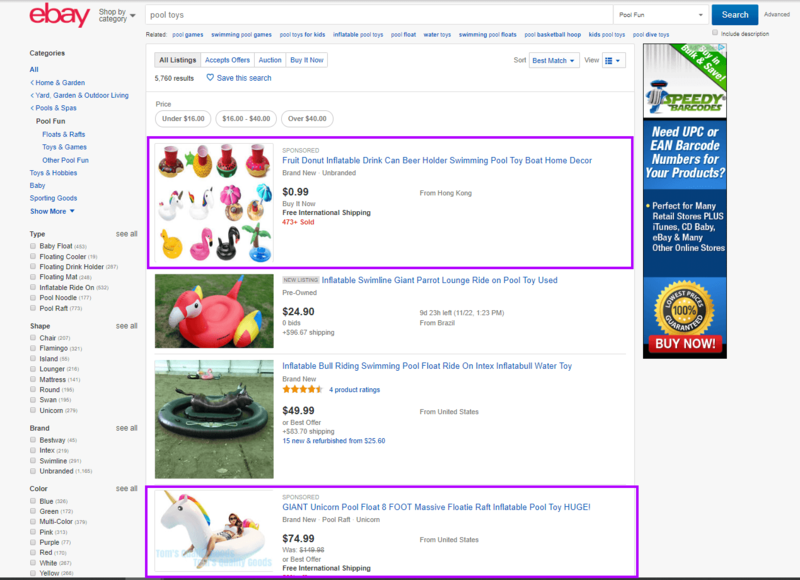 Not every product search term seems to have found a bidder for Headline Search Ads on eBay – the screenshot of eBay search results for ‘pool toys’ above doesn’t show one at all. Amazon is in the lead when it comes to the number of active customers. eBay charges the smaller fees. So which platform is more profitable? In the end, no one really knows. It depends on what you are selling, at what margin, and how hard you work. Amazon’s conversion rates are, due to Prime members, considerably higher. A study found that the conversion rate of Prime members is a whopping 74%, compared to 13% of non-Prime members. In this regard, eBay simple can’t compete. Sellers report an average of 8% conversion rate. Sellers on eBay keep, on average, 5% more profit than Amazon sellers. According to data from Germany, the two platforms are in a very close head-to-head race concerning traffic, but eventually, Amazon sellers, on average, make 2.6 times as much as sellers on eBay. It seems that Amazon might be outperforming eBay in profitability for sellers. Conclusion: When should you sell on Amazon, and when on eBay? The Sellics Software makes selling on Amazon easier, faster, and more successful. 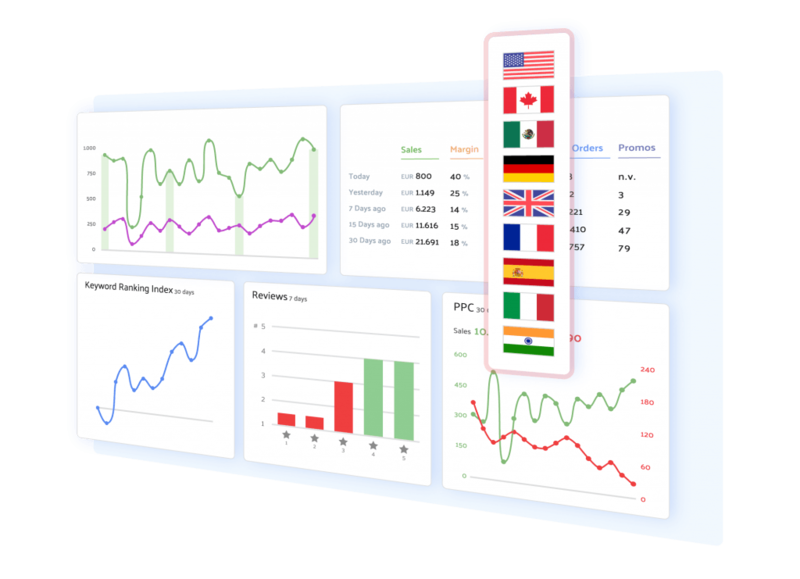 Manage all your business activities in the same place – seven tools integrated into one interface: see your real-time profits, improve organic ranking, optimize your PPC campaigns and more.